And how does this Texas Instruments 1265 fit into the line? 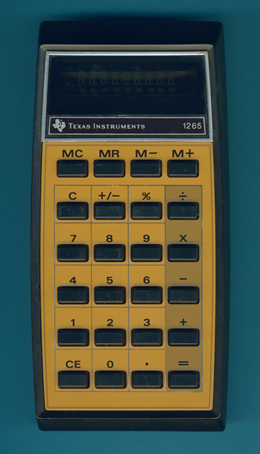 Thanks to our fellow calculator collector friend Michel Zwawiak in France, we know the roots of this strange product: It was sold in 1977 by Koh-i-Noor Hardtmuth, a manufacturer of pencils, pens and art supplies based in the Czech Republic and already known for the incredible Texas Instruments 30/super. © Joerg Woerner, April 6, 2011. No reprints without written permission.